The Military Museum of Ṣanʿāʾ is one of the most prestigious and famous museums of Yemen. Established in 1984, it is housed in a beautiful building named Dar as-Sanay. The museum preserves testimonies and documents related to the recent history of Yemen, since the Imamate until the proclamation of the Republic. The Military Museum is also home to a large collection of ancient South Arabian artefacts: alabaster stelae decorated with ibex, altars, statues, inscriptions and numerous wooden sticks inscribed with texts in minuscule writing. Many of these findings are of great historical importance or of great historical and artistic interest, and not by chance have been chosen in the past to be part of the international traveling exhibition on the ancient civilization of Yemen hosted in Italy and in other European countries. 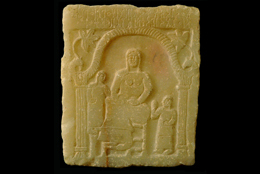 Two alabaster stelae are particularly remarkable for the subject represented: the first shows a figure resembling the winged genius of the Mesopotamian artistic tradition. On the second one, an armed infantryman with helmet precedes a warrior riding a camel and holding a spear. A number of inscriptions and artefacts, including altars, stelae and incense burners, come from the city of Kamna. They are dedications to the city god Nabʿal and testify for the most ancient phases of South Arabian history. The Military Museum of Sana was inventoried within the CASIS project in November 2009 and November 2010. Photos are courtesy of the Military Museum of Ṣanʿāʾ.